Deep learning has quickly become a must-have technology to bring new smart sensing and intelligent analysis capabilities to all of our electronics. 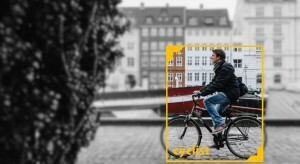 Whether it’s self-driving cars that need to understand their environment, surveillance cameras that need to recognize people, or mobile phones that provide face-unlock functionality, deep learning is required. Deep learning algorithms require very high compute power and data throughput though, which has stopped them from being adopted in many cases. 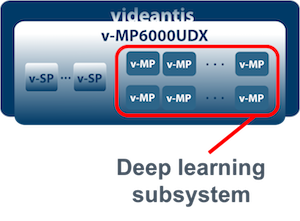 Therefore, we have developed our v-MP6000UDX processor family, which can run even the most demanding neural networks at very lower power and in real time. The v-MP6000UDX processor architecture is our next-generation scalable processor family that has been designed to run high-performance deep learning, computer vision, imaging and video coding applications in a low power footprint. The v-MP6000UDX architecture follows the successful v-MP4000HDX processor family and remains backward compatible, ensuring an easy upgrade path for current v-MP4000HDX software developers. The heterogeneous multicore architecture combines multiple VLIW/SIMD media processors (v-MPs) with a number of stream processors (v-SPs) that accelerate bitstream packing and unpacking. Ultra-high MAC throughput: We’ve extended the v-MP4000HDX to provide up to 64 MAC operations per cycle for each core, performing up to 16384 MACs per cycle in total. Scalable architecture: 1 to 256 cores address ultra-low cost to high performance applications. Enhanced memory architecture: Distributed, multi-banked and hierarchical memory architecture for ultra-high-bandwidth and low power. Runs complete CNNs: Processes all layers of CNNs in one place, not just the convolutional layers. Unified architecture: Same architecture runs all visual processing tasks: deep learning, imaging, video coding, computer vision, SLAM/SfM all run on the same multicore architecture. Supports a wide variety of networks: All your favorite networks are supported, including AlexNet, GoogLeNet, ResNet, VGG-X, YOLO, MobileNet, etc. Supports TensorFlow, Caffe/Caffe2, PyTorch, and others: Design and train your networks with your favorite framework, then import them into v-CNNDesigner for optimizing and mapping them onto the v-MP6000UDX architecture.